Apenao enters this awesome sequel (with a mistake in the title) to last year’s Mojon Twins’ entry, the infamous He had such a big head that, if he were a cat he would have to toss the mice from under the bed with a brow, which made us almost lose the compo. Apenao’s own He had such a big head that, if he were a cat he would have to toss the mice from under the bed with a brow, part II, which title is incorrectly written in the intro screen as He had such a big head that, if he were a mouse he would have to toss the mice from under the bed with a brow, part II uses a revolutionary concept of fast loading: in fact, after the loading screen, the load is 100% immediate! I really don’t know how Apenao achieved this, I hope he will tell us. The game comes complete with a great backstory, very reminiscent of the Mojon Twins style: After saving his girlfriend, our hero, Manolito Cabeza, goes to El Corte Inglés to buy her a present. The problem is, the square is full of people demanding a more just distribution of prawns (digital or not) and, more important: the mall is closed for hollidays. Once there, Manolito discovers that a bunch of hippies are unknowingly being controlled by a group of ultra-center-wing fanatics and are being used to spread a plague of lice which will end up bringing the end of the world. Luckily, Manolito has three full packs of anti-lice liniment and is ready to save the world!. 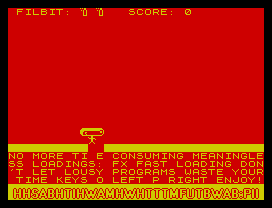 After waiting for the title screen to get drawn (this has to be a feature in most Apenao‘s productions), you realize that the game has nothing to do with this. Great job, Apenao! Just try not to lose your patience in the title screen.